Palazzo Strozzi in Florence will present Italy’s first major retrospective dedicated to one of the world’s most celebrated, influential and controversial contemporary artists: Ai Weiwei. A dissident artist with a leading voice, Ai Weiwei is known worldwide as much for his challenging contemporary art practice as for his political activism. Ai Weiwei will be the first artist to exhibit across the entirety of the Palazzo Strozzi spaces, presenting a series of new and major works from the façade of the building and the courtyard to the piano nobile and the Strozzina gallery. Mirroring the artist’s relationship between tradition and modernity, key works will be hung in response to the architecture of the Palazzo Strozzi, a 15th-century palace built as a political statement, and is considered to embody the history of the city of Florence. 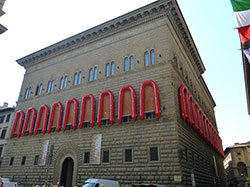 The city got a first taste of the highly anticipated exhibition with the installation of twenty-two large orange rescue dinghies grafted onto Palazzo Strozzi’s windows to draw the public’s attention to the fate of refugees who place their lives in jeopardy every day by crossing the Mediterranean to reach Europe. This major exhibition will include key monumental installations, sculptures, and objects, as well as videos and photography series produced throughout his career. These range from his years living in New York 1980s and ’90s when he discovered his ‘masters’ Andy Warhol and Marcel Duchamp, to the large iconic assemblages works from the early 2000s consisting of objects such as bicycles and stools, to his recent controversial and engaged works such as portraits of political dissidents built with LEGO bricks, and his projects on migration in the Mediterranean region. 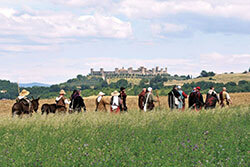 Slow Travel Fest, the first Italian festival dedicated to slow travel, is back in the Medieval Castle of Monteriggioni. Three days meetings, excursions, art, music, and nature in Monteriggioni and along the ancient route of the Via Francigena celebrating the culture of slow travel on foot and by bicycle. Slow Travel Fest includes excursions in the area surrounding the Via Francigena, as well as opportunities for national and international tour operators from the slow travel sector to get together, exchange ideas and promote their work. The rich program includes: photo and art exhibitions, book presentations, music concerts, workshops (also for children), treasure hunt, bike tours, hiking tours, Nordic walking, and more. The complete program is available on the festival’s website. 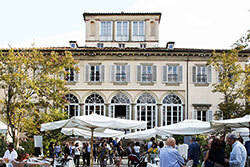 Fashion in Flair is Lucca’s fashion fair showing some of Italy’s finest fashion, art, and craftwork in the beautiful setting of the classic 16th century Villa Bottini. The three-day event features the best in Italian-made quality clothing, jewels, accessories, furniture, and art. As well as creative, wellness and beauty workshops, entertainment, food, and wine. The restored stately Villa Bottini, built in 1566 within Lucca’s walls, was once owned by Napoleon’s sister, Elisa Baciocchi, who bought it early in the 19th century. The historic villa is a natural showcase for fine craftsmanship and provides the featured craftsmen with a perfect setting to show off their work. Once the wine consumed in Florence came from the Rufina area and the offering of the wine to the Nobility of Florence by the Wine Guild was a big happening in the city. 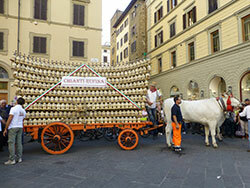 The 1500 wine flasks were transported to Florence, stacked in a pyramid form on a wagon pulled by oxen, the so-called Carro Matto (Crazy Cart). The Carro Matto is accompanied by a colorful historical parade of the Republic of Florence with musicians, flag bearers, soldiers with a real canon and ladies with basket bottles, all dressed in Renaissance costumes. 3.30 pm | Historical parade starts from Palagio di Parte Guelfa, via Calimala, passes through via Roma to Piazza San Giovanni where the wine cart will join the procession. 4 pm | Blessing of the wine. The procession proceeds through Via Calzaiuoli e Piazza della Signoria. 4.45 pm | Piazza della Signoria – wine offerings and flag throwing show of the Sbandieratori degli Uffizi. 7.15 pm | The wine cart leaves through Via Calzaiuoli e Piazza del Duomo. 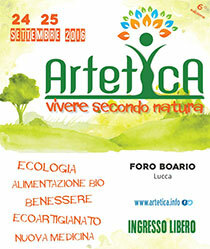 The 6th edition of the festival that brings together ideas, products, and people dedicated to create a sustainable world. The main topics range from eco-crafts, volunteering, healthy eating and care of your body and spirit. The festival hosts many guests and meetings to promote information and eco-culture and provide valuable insight on possible sustainable and ethical lifestyle choices. There are various and selected craftsmen of creative recycling, from all over Italy ready to dazzle the visitors with their creations. Furthermore ‘ethical’ companies operating in the eco-industry, health, and well-being: from organic and vegan cosmetics for the most curious and original eco-gadgets, up to publishing ethics which as always will offer a range of books and magazines related to eco-development issues, holistic and healthy food. Inside the covered food court, you can enjoy special culinary experiences that in this edition include an exhibition of different products, from sweet to savory, and the best beers and bio sodas. 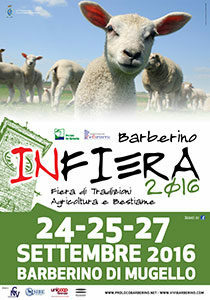 The yearly fair of Barberino in the Mugello area north of Florence is a three-day event dedicated to local traditions, agriculture, and livestock. On Saturday and Sunday, dozens of exhibition stands will occupy the streets of the town for the fair’s market with local agricultural products. The livestock fair will take place on Tuesday, September 27th. The program includes furthermore: livestock and domestic animals, agriculture exhibitions, birds of prey demonstration, pony rides, dog demonstrations, Oktober Fest with beer and live music, Country Folk concert, performances, children’s area. 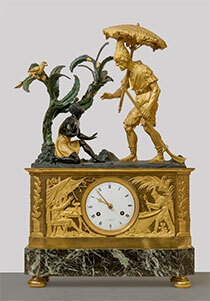 The exhibition consists of a selection of 80 clocks out of the total of 200 pieces in the collection of Palazzo Pitti, from the 18th to the 20th century. The collection will allow visitors to admire the astonishing technical and artistic quality of these timepieces in the various forms and formats in which they were designed. The eleventh edition of the international contemporary circus festival Cirk Fantastik is bigger than ever with 60 shows of performing arts from the best European artists. The afternoon programs are especially for a younger audience, while the evenings are filled with shows for a diverse and curious audience. 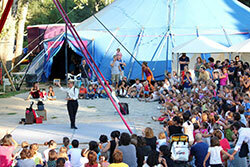 During the day you can also follow free workshops or go to circus school. Among the performing companies are: Circo “eia” (Spain), Brunette Bros (Denmark), Juri the cosmonaut (Italy/Czech Republic), Teatro Necessario (Italy), Magda Clan (Italy), Trespertè (Spain), Los Filonautas (Germany/Argentina), Zenhir (Italy), Nani Rossi (Italia), Trio Trioche (Italy/Switzerland), Luigi Ciotta, Osvaldo Carretta, Nando e Maila, Guido Nardin, Otp, Vola Tutto, Beppe Tenenti, Aurelia Dedieu (France), Circo Nai and many more. The complete program is available on the festival’s website. The animal-free circus festival will put up its tents in the biggest park of Florence Le Cascine, just south of the city’s historical center. The park can easily be reached by tram from the station, stop Cascine, or by bus 17 stop Piazza Kennedy. Openings hours: Open every day from 10 am until midnight. 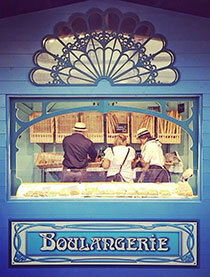 Experience the magical atmosphere of 19th century Paris at the French Market Belle Epoque in Florence. Stroll through the market packed with French products such as wine, cheese, linens, herbs and teas. Enjoy a croissant or a glass of wine while listening to jazz music. 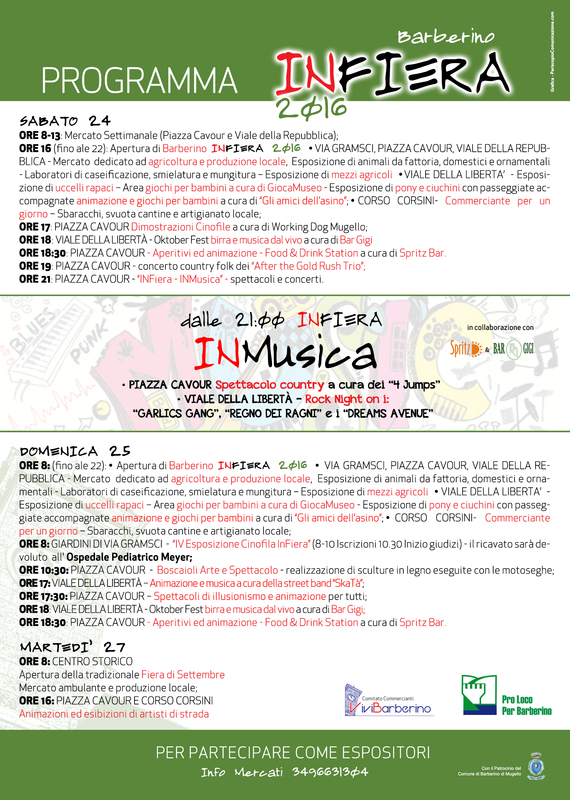 Do you want to get informations about attractions and events in Tuscany? Please leave your email address here.